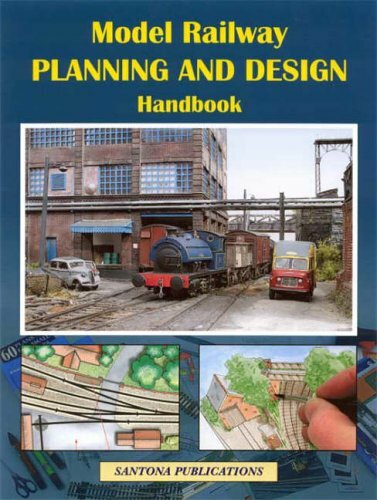 The Model Railway Planning and Design Handbook brings together advice, hints and ideas from a number of respected model railway authors to help plan and design a model railway layout. Paul A. Lunn; Neil A Ripley; Ken Gibbons; and Jack Burnard have collaborated together with overall editor Steve Flint in this Santona publication. Each author has written a section of the book on his specialist subject, and each section is therefore pretty much stand alone by itself. There is a very definite focus on compact schemes so this book is ideal for the modeller with limited space, although the final chapter concentrates on O gauge, and even compact O needs a lot of room! Paul A. Lunn then looks at easy to build layouts for beginners and gives four schemes the biggest of which is only 6′ by 4′. Neil A Ripley provides chapter 3 looking at Industrial, Dockland and Light Railway Themes. This is nicely illustrated with examples from Neil’s own Walker Marine and Carlton Metals layouts and a number of schemes are provided for further inspiration around the Micro Layout concept. Scheme10 BMC Shortbridge takes its inspiration from the industrial car manufacturing area in Birmingham and is a spare room sized continuous run. Scheme 11 Designing an Extension is one of the best in the book, exploring how an initial micro scheme can be extended into something bigger. Scheme 12 Foss Island Branch, featuring Rowntrees factory in York. A scheme similar to this featuring the factory is out on the exhibition circuit and features a very impressive photo backscene of the real factory. Ken Gibbons is responsible for chapter 4, which covers contemporary designs for the british railway scen. Ken is a fan of the rail blue era and most of the designs in this chapter are set in this period. Scheme 18 Craven Lines is designed for N gauge and is a large Settle & Carlisle based scheme. Scheme 19 North Lincs Junction is another intended for N gauge, and is a very extensive multi level main line with extensive operating potential. Jack Burnard provides chapter 5, Exhibition Schemes for the Larger Scales and draws on his extensive experience of working in O gauge. Jacks own layouts “Runswick Bay”; “Ravensbeck”; and “Rainton Colliery” are featured to illustrate design concepts along with some excellent plans and photos of the layouts. The three schemes in this section all exten Jacks’s interest in the North Eastern Railway and reflect various aspect of the coal industry. Scheme 22 Houghton Coal Loop extends the concepts of Jack’s own Runswick Bay layout. With plans to suit all levels of skill from beginner to advanced it is quite amazing what can be fitted in to a small space and look ‘right’. this book shows that you don’t need an lot of space or rolling stock so won’t cost an arm and leg. Steve Flint has been an active modeller for over 40 years and currently works as editor and photographer of RAILWAY MODELLER, the UK market leading model railway magazine. He has compiled this book and has contributed much of the photography and finished graphic artwork. Neil A Ripley is the designer behind the award winning layouts Walker Marine, Carlton Metals and Hospital Gates. He is attracted to unusual and off the beaten track prototypes. He presents a selection of his ideas based on industrial, dockland and light railway themes, with each one supported by a superb watercolour illustration of how the final layout might appear. Ken Gibbons is a prolific designer and builder of layouts in 4mm scale and is best known for his small space British Rail ‘Blue Era’ schemes. Here he proposes a selection of contrasting designs as a means of representing the mainstream British Railway scene which make use of many of the recent state-of-the-art model releases. Jack Burnard models in Gauge 1 and O Gauge and is well known as the designer of larger scale classics as Ravensbeck, Runswick Bay and Houghton Colliery. His liking is for busy entertaining layouts that are easily transportable.